You believe that most people have a very short attention span. They are bombarded by information, but very little of it survives. You want your information -- whether an idea, an event, a product's features and benefits, a discovery, or a lesson -- to survive. You want to divert their attention toward you and then capture it, lock it in. You will always do well in roles in which you are paid to capture people's attention. Your strengths will probably flourish in teaching, sales, marketing, ministry, or the media. When you are presenting, listen closely to your audience. Watch their reactions to each part of your presentation. You will see that some parts prove especially engaging. After the presentation, take time to identify the parts that particularly caught the audience's attention. Re-draft your next presentations around these highlights. 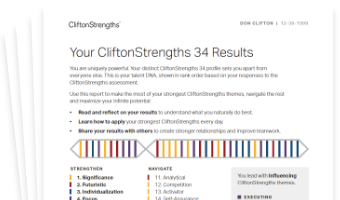 See how Communication shows in your CliftonStrengths results -- discover All 34 CliftonStrengths Themes today!